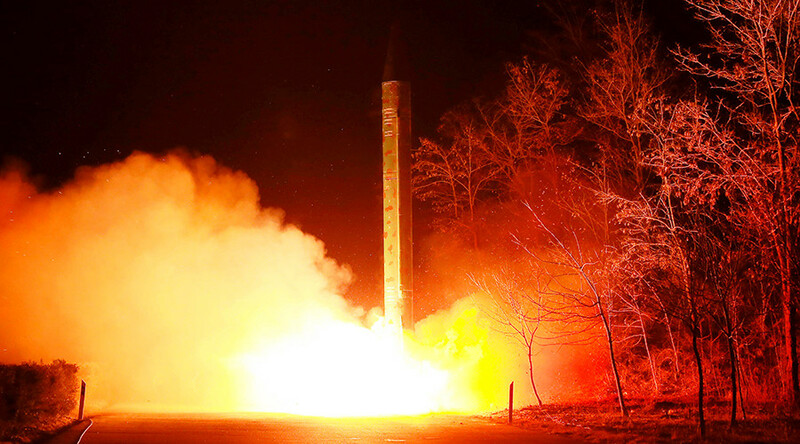 North Korea has launched an “unidentified projectile” which flew around 700 kilometers and landed in the Sea of Japan, South Korea has said. "North Korea launched a ballistic missile at 5:27am this morning in Pyongan Province," South Korea’s Joint Chiefs of Staff said, adding, that it is now analyzing the launch. The US military tracked the launch, but said it was unlikely an intercontinental ballistic missile. "The type of missile is being assessed and the flight was not consistent with an intercontinental ballistic missile," added the spokesperson for the US military’s Pacific Command. The Russian Defense Ministry said the projectile was in the air for 23 minutes and fell into the central part of the Sea of Japan, some 500 kilometers from the Russian coast, adding that the apparent missile test had posed no threat to Russia. Chief Japanese Cabinet Secretary, Yoshihide Suga, called the latest test a violation of UN resolutions as he and Prime Minister Shinzo Abe condemned the move and issued a strong protest over North Korea’s actions. Japan’s Chief Cabinet Secretary said North Korea launched the ballistic missile which flew for about 30 minutes before crashing into to the Sea of Japan. 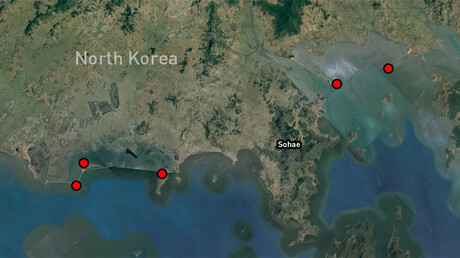 Suga added that the missile appears to have fallen outside of Japan's exclusive economic zone (EEZ). Pyongyang’s ballistic missile flew around 700 kilometers, South Korea's military said, according to Yonhap. On Sunday, Beijing called upon all the parties to refrain from escalating tensions after Pyongyang fired the missile. “At present the situation on the peninsula is complex and sensitive, and all relevant parties should exercise restraint and do nothing to further worsen regional tensions,” the Chinese Foreign Ministry said in a statement to Reuters. North Korea’s alleged ballistic missile test is the country's first since South Korea elected Moon Jae-in as their new president. Saturday’s launch follows two previous failed attempts last month. 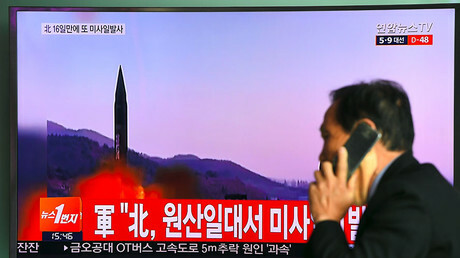 The reported launch comes amid rising tensions in the region and a US military buildup in response to the North Korean nuclear and ballistic threat. In an attempt to deter Pyongyang from more nuclear and missile tests, the US has sent a group of American warships, led by an aircraft carrier, to the region while conducting war games with their regional allies. Last month, Washington also positioned elements of the THAAD anti-missile system on the Peninsula. While military option against North Korea remains on the table, Washington is also pursuing diplomatic channels to address the issue. In particular, the US has persuaded China to apply more pressure on its communist neighbor. China and Russia have condemned North Korea’s missile and nuclear tests, but both countries insist on resuming the stalled six-party talks initiative to solve Pyongyang’s nuclear issue. The US meanwhile, has been threatening the North Korea with additional sanctions. The White House has condemned the latest launch and has called on the international community to impose tougher sanctions on Pyongyang. A spokesman for the executive branch also called N. Korea a "menace" on Russia’s borders. "With the missile impacting so close to Russian soil – in fact, closer to Russia than to Japan – the President cannot imagine that Russia is pleased," the White House said in a statement. "North Korea has been a flagrant menace for far too long," the statement added. "Let this latest provocation serve as a call for all nations to implement far stronger sanctions against North Korea." On Friday, Pyongyang appealed to the United Nations to reconsider implementing any new measures, accusing Washington of “openly threatening [other] member nations” to implement economic pressure on North Korea. “It will be only a laughing stock of the international community that with hysteria about sanctions, the US has mistaken even ordinary restaurants run by the DPRK abroad for nuke or ballistic rocket manufacturers,” the statement from the North Korean UN mission carried by KCNA said, ridiculing Washington’s push for further sanctions.